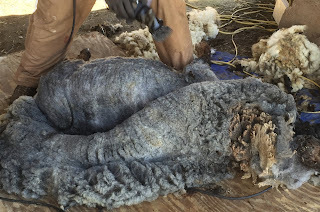 When scheduling a shearer for an early spring shearing, a major concern is rain. Everybody gets wet (and cold) and finding a covered place for the skirting table just adds one more planning element to an already crazy-busy day. But this year's March day couldn't have been better. It was a spectacular meteorological gem. Sunny, dry and cool. Just perfect. This year there were only eight ewes to be shorn and M. and I were able to stay ahead of the shearer--if only just barely. With years of experience, Hoyt Emmons shears each sheep smoothly and efficiently. Once he is done and steps aside, the quickly haltered sheep gets personalized care and its fleece moves to the skirting table. My standing assignment is at the skirting table. You can see the table in the photo at right below. It's a large wooden frame fitted with spaced PVC pipes that roll, allowing unwanted pieces to fall through. After identifying which end is which, that is, head vs. rear, the work begins. The sheep at Winters' Past Farm wear coats, which keeps their fleeces clean, so most of the fleece needs no special attention. But what was outside the coat--the neck and upper chest and the belly wool in particular--does. The head and neck area often has so much vegetative matter that it must be removed. The back end has its own issues, but it's a straightforward cleanup, as are the belly sections. As Kris reminds us, anything that clunks, goes. Once skirted, the fleece is folded into thirds, rolled up, bagged and tagged. This is the first round of cleanup. Kris will meticulously skirt the fleeces again sale. 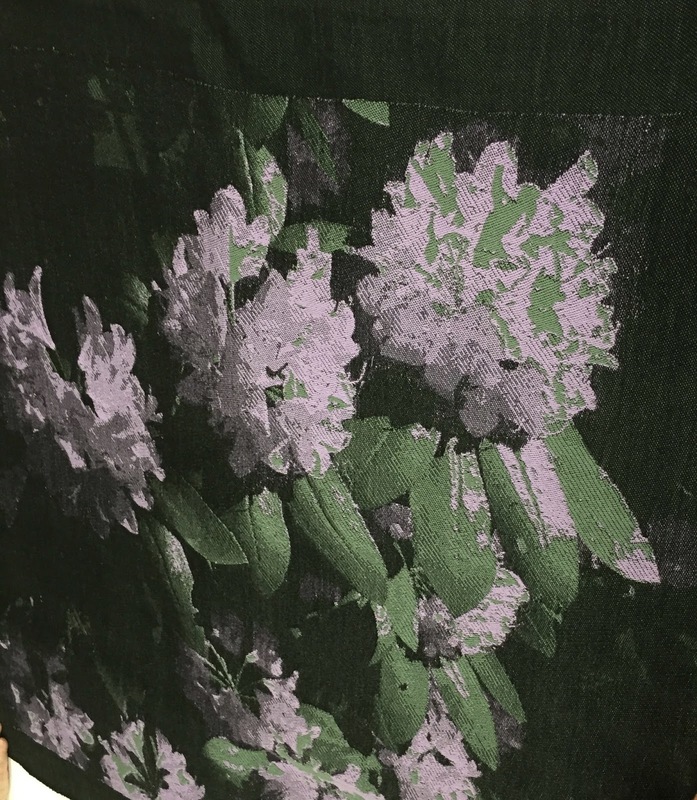 You may recall my frustration last fall when I assumed ownership of an orphaned sale fleece that was so contaminated with excrement and vegetation that after picking through it, only a fraction of the fleece--about one and a half pounds--was usable. The last fleece comes off--and what a beauty! There was some dismay, but no surprise, when one ewe's fleece had a break in her wool. She'd had a stressful winter after she added quadruplets to the flock. But the last sheep in queue was a beauty. Just look at that fleece! I almost--hear that? almost!--broke my vow and bought the fleece right then and there. It is that nice. I don't know what was more fun to watch--the lambs or the kids at play. Needle felting is fun, costs little to get started and is portable. But it's hardly suitable for making larger pieces like those beautiful hats and jackets that I so admire. For that order of felting, you need the big guns of the fiber felting world. I had heard of felting machines, but had not seen one in action. Indeed, the machines, which are designed and manufactured in Kentucky, are quite impressive. Kris and I spent Sunday afternoon seeing what the FeltLOOM would do with a bag of roving. After laying out the requisite three crosshatched layers of roving, the rollers grabbed it, rolled it under hundreds of felting needles and spit it out as a flat and felted sheet. It took us far longer to lay out the roving than for the needles to felt the material. And no Band-aids are needed for this operation: The needles are safely contained within plexiglas-like shields. Currently, membership in groups of all kinds is at an all-time low. The causes, of course, are varied but two things are commonly cited: Time--people are busy--and the Internet. Why attend a meeting when all the information is online? The Internet may be an awesome resource, but there is nothing like the personal experience of sharing with others. And whether you're looking for inspiration or information, a guild is the place to find it. I recently attended two guild meetings. One was the New York Handweavers Guild's annual show-and-tell. Sitting around a large table, members shared their projects from the past year. A wealth of information accompanied each piece. Some projects originated with a workshop the weaver had taken. Others were independent studies. Here are few I particularly liked--and their photos came out. Perhaps because the South Jersey Guild has been studying double weaves this year, I particularly liked Terry's deflected double weave. And the linens! I confess that I've never been inclined to weave hand towels but I may have to reconsider after seeing some of the beautiful handwoven towels and that lovely damask napkin yardage. One project was the happy outcome of a favorite sweater that had been felted by mistake. (She made a vest and mittens.) She also made tote that was upcycled from a Harris tweed jacket (below). Very clever! The program at the South Jersey Guild of Spinners and Handweavers was led by Ellen Turner, who taught members how to make a dragon boat ornament. It's cleverly wrapped. No weaving, sewing, braiding or spinning involved. Interested in finding a guild? Here in the Northeast, there a number of guilds that are likely to be within a reasonable distance. (The MidAtlantic Fiber Association, MAFA, counts nearly 60 in that region. For other locations, find a guild or club in your area at the Handweavers Guild of America.